Acti-wet is an Agricultural Spray Adjuvant & Surface tension reducing agent. It is an effective super spreader based on silicone in primary form. Content: Silicone based non-ionic surfactant. Acti-wet is an Agricultural Spray Adjuvant & Surface tension reducing agent. Acti-wet is an effective super spreader based on silicone in primary form. Acti-wet can be used effectively in all seasons & for all types of crops. 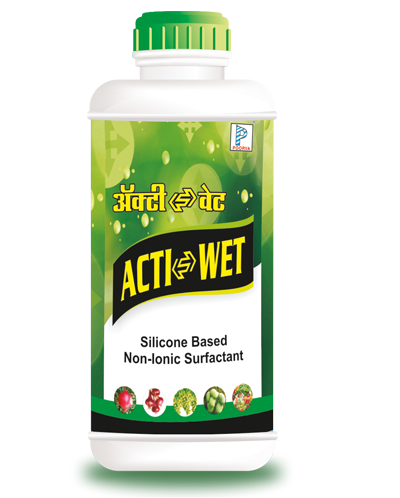 Acti-wet is useful for faster & enhanced spreading while spraying of agrochemicals. Because of addition of Acti-wet in the spray solution, the spray solutions get fast penetrated in the plants making spray solution rain fast & due to this, maximum benefit of spray solution observed. Acti-wet can be used effectively with all types of agrochemicals viz. Insecticides, Fungicides, Herbicides, Water soluble fertilizers, micronutrients & certain plant growth promoters etc. Acti-wet leaves no residue when sprayed with pesticides. It is very cost effective product. Can be used with almost all insecticides, fungicides, weedicides and nutrients. 15ml to 20ml / 100 liter Water.